This very creative Steampunk version of the classic unit-construction Triumph was displayed at this year’s NTNOA Lake O’ the Pines Rally. The builder has combined bits and pieces from a wide variety of industries to produce a truly unique motorcycle. For example, the headlight was taken from a miner’s hat and the oil tank is part of a hardhat diver’s helmet. Note the homemade rear suspension that is a copy of an even older British design. The speedo may not be functional but it sure looks cool. The builder deserve high praise for this truly unique motorcycle. This “Harton” special features a combination of two of the best examples of British and American Motorcycle History. It’s a mid-60s 900cc Sportster engine mounted in a classic Norton “Featherbed” frame. The Norton frame, patented in 1949, was specifically designed for racing but later made its way to street bikes. The Sportster was Harley Davidson’s attempt attract sport riders of the time with right hand foot shift and a lightweight frame. Tritons, Norton frames fitted with Triumph engines, are well known among classic bikers but this Harley-Norton may be one of a kind. A fine example of how build what you want out of parts that you have. The engine is a low-compression �69 Harley Sportster 900. Frame is C & J flat-track. Forks and shocks are Mulholland. Preston Petty plastic fenders. Custom-made fiberglass gas tank, seat off a Honda XL250, Malcolm Smith tool bag. The frame had to be modified in order to get a generator to fit between the asymmetrical front down tubes. This BMW special was ridden to the British Motorcycle Owners Association Rally in New Ulm, Texas. Special features include the custom frame, gas tank, and seat. Especially interesting is the long distance gas tank mounted on the rear fender, the nail puller brake pedal, and the egg-shaped tool box. The builder of this bike deserves a lot of credit for artistic imagination. Ivan in <?xml:namespace prefix = st1 ns = "urn:schemas-microsoft-com:office:smarttags" />Denmark sent in these pictures of his Royal Enfield Special. Ivan says only the crankcase and the oil pumps are RE parts. The rest of the parts come from 10 different bikes. Great Job Ivan! This is a 1968 Mark 1A Royal Enfield Interceptor engine in a modern (metric) frame. The 750cc Interceptor was a super bike of its day and this one will certainly be nimble and fast with a top speed around 120 mph. The tractor seat on this BMW looks like a hard ride but it certainly fits with the overall style of the bike. This bike was ridden to the British Motorcycle Owners Association annual rally in New Ulm Texas. What a great pit bike. If one engine is not enough for a minibike then get three. This is the first multi-engine mini-bike that I have seen. It was parked in the pits at Bonneville Speed Week 2007. Here�s a clever idea. Use one cylinder to supercharge the other cylinder. 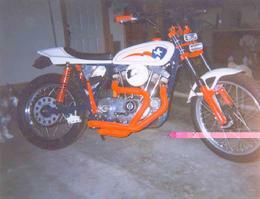 This 1000 cc Sportster was running in the 500 cc class at Bonneville 2007. Converting a two-cylinder engine into a supercharged single is a really great idea. This bike has a special, custom head mounted on the front cylinder. The carburetor is mounted on the front head and sticks out on the left side of the bike. I spotted this bike at <?xml:namespace prefix = st1 ns = "urn:schemas-microsoft-com:office:smarttags" />Cadwell Park racetrack in England in 1987. I believe the engine is an 1100cc NSU car engine very neatly mounted in a custom built frame. The gas tank may be a little small but it fits in with the ultra-slim styling. The embossed side cover on the engine is a first class feature as are the Brooklands style mufflers. Also note the carburetors just below the fork head. This has to be the most powerful Cushman Eagle in history. The stock Eagle had an 8 horsepower flat head engine. This 883cc engine is more like 50 horsepower. It looks like the frame has been altered slightly to fit around this massive engine. The builder of this special said he found the engine is a junk yard and built the bike around it. Fitting the radiator in the saddlebag was a great idea. The front of the saddlebag has a wire mesh grill to disguise the opening. Note how the carburetor protrudes through the gas tank. This double engined Special was parked in the Swap Meet area of Mid-Ohio in 2004. Note the electric fans for cooling the rear engine. The handlebars have been moved closer to the seat with tie-rod links to the front forks. The instrument panel added between the seat and the gas tank is a clever idea to fill up the space in the longer frame. This bike looks so good it almost looks factory made. It has a 1200cc Datsun B210 engine and a BMW motorcycle engine. The exhaust system and radiator are especially well carried out. I saw this special in at Daytona Bike Week in 2002. Although it�s obviously based on the Honda minibike (or Monkey Bike as its know in the <?xml:namespace prefix = st1 ns = "urn:schemas-microsoft-com:office:smarttags" />U.K.) the 250cc Ducati engine and the Ducati decals on the tank and chain guard keep everyone asking if this was a �real Ducati�. This wooden frame motor scooter is powered by a real, two-cylinder, gasoline Maytag washing machine engine. The Maytag brochure shows a ladies shoe pushing the kick starter. Also note the slip-on wooden kick stand. A fine looking bike up close or from a distance. The 125cc Honda engine has dummy rear cylinder grafted on the crankcase at just the right angle to look like a Harley. The separate gearbox mounted between the engine and back wheel and the Harley oil tank completed the disguise. 1000cc Ariel Square Four engine and frame with Norton fork and gas tank. The solo seat and chopped rear fender make the engine look extra big.